After a hard-knock rookie year that resulted in the former Formula 1 driver crashed out 10 times through the 17-race 2010 IZOD INDYCAR Series season, Japan's Takuma Sato and KV Racing Technology entered 2011 ready to embrace a better on-track performance. Starting the season off with a 5th place finish on the Streets of St Petersburg event wheeling the #5 KV Racing Technology car, Sato also enjoyed some success on the Milwaukee Mile oval. Finishing 8th in the event, Takuma Sato overcame being faulted for contact with a crew member in pit lane. 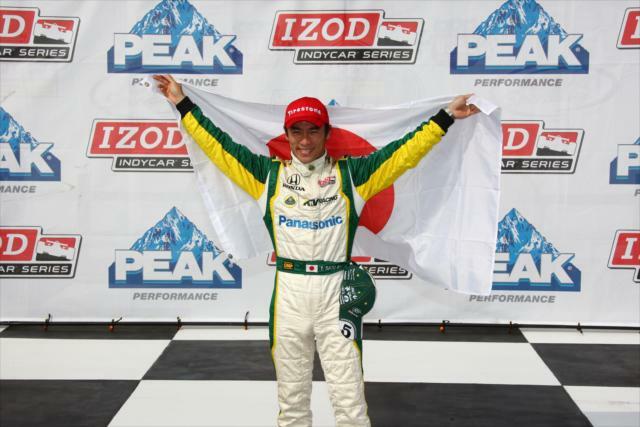 In the time trials for the Iowa Corn Indy 250, Sato's transition from the Formula 1 world championship to the IZOD INDYCAR tour involved a major progression. Lapping the 7/8 mile Iowa Speedway in 35.6857 seconds, sophomore driver Takuma Sato stormed a surprise pole position. Takuma Sato's top qualifying effort came hours before a collision on track. During IZOD INDYCAR Series practice, Sato and the #77 Sam Schmidt Racing of Alex Tagliani collided. "I was approaching on the outside at a much greater closing speed because I think (Tagliani) was just coming out of the pits." Sato said regarding the accident. Alex Tagliani said overwards that the #5 car didn't gave enough room on the oval disappointed for his team. While the presence of Takuma Sato on the pole served as unusual, the entire Friday evening qualifying session for the Iowa Corn Indy 250 took on an interesting complexion. Starting with Sato on the front row is Andretti Autosport driver Danica Patrick who was little more than 3/100th of a second slower than the #5 KV Racing Technology car. For Patrick and the #7 Godaddy.com Dallara-Honda, this is the 29 year old's highest starting spot since Homestead of 2008. Starting directly behind his teammate, Tony Kanaan continues to the #82 Geico-sponsored KV Racing Technology race car a week after a near victory at the Milwaukee Mile. Driving for Andretti Autosport last season, Kanaan captured the win at Iowa Speedway for the team's second and final 2010 series victory. Behind 4th place starting JR Hildebrand, Penske Racing's Will Power secured a row three starting spot for the Saturday night event. After being considered a road course warrior only, Power has been vastly improved in oval racing competition. At Iowa Speedway, Will Power has a 5th place finish in 2010 and a 9th place result during the 2008 season when he drove for KV Racing Technology. Tied in the 2011 IZOD INDYCAR overall standings with Will Power heading into Iowa, Dario Franchitti will roll off beside his #12 car rival. James Hinchcliffe, Ryan Hunter-Reay, Mike Conway and Ryan Briscoe rounds out the top-10 in qualifying for the Iowa Corn Indy 250. Only 3/10th of a second separated pole sitter Takuma Sato and 10th place Ryan Briscoe in qualifying. Two events of note is the presence of one front-running competitor in the rear and another series favourite on the sidelines. Almost spinning out in qualifying, the #9 car of Scott Dixon will be third to last in the starting lineup. "We are just way too loose and it was not what we're looking for." the New Zealand drive said as he prepares to launch from a 23rd place position. Not racing at the Saturday night event on the Iowa Speedway oval will be Simona de Silvestro. The Swiss driver appeared at the race track Friday but did not receive medical clearance to drive for this IZOD INDYCAR Series event. Having undergone the standard IMPACT test, INDYCAR Medical Director Dr. Michael Olinger noted that de Silvestro was showing post-concussion symptoms following a practice crash in Milwaukee qualifying this week. Following de Silvestro's evaluation, her HVM Racing team decided to head back to their race shop and sit out the Iowa event. Unleashing the 25-car IZOD INDYCAR Series field, the Iowa Corn Indy 250 is set to roll at 8pm Saturday night.